Like “GasLand,” a documentary I watched a couple months ago, “The Cove” is filed under that “I really wish this wasn’t true” category. It’s a disturbing, disturbing film, the type where each new scene seems to reveal some other horrible act that just doesn’t feel like it should be happening. If you’ve ever watched the show “Whale Wars” on Animal Planet, you’re aware of the basic idea here: Japanese fishermen are a pretty classless and unethical bunch, and work with local and national government agencies to exploit loopholes that allow them to hunt (and wholesale slaughter) whales and dolphins. And what’s scariest about the slaughter is that most of the country doesn’t seem to know that it’s happening. “The Cove” shows two Japans: one–the big city–where citizens are shocked to learn that there is a Japanese town built upon dolphin slaughter, and that dolphin meat is consumed (and in some cases, marketed as another type of fish altogether); and the other–the small town of Taiji–where the citizens literally conspire to keep their dolphin industry a secret. Almost no one knows what is happening. Outsiders are chased out of town, jailed. The footage obtained for this film comes at a remarkable cost (the filmmakers had to enlist Industrial Light and Magic to create special hidden cameras that would blend into the landscape). When I watched “GasLand,” I said that I hadn’t seen something so disturbing in years. 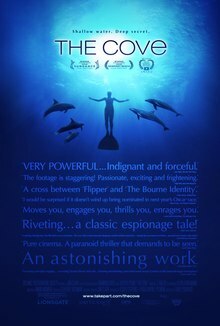 When I watched “The Cove,” unfortunately, I can only say that I haven’t seen something so disturbing in months…but still, this is a movie that does what so few documentaries are able to do: it reveals an aspect of our international culture that should not be true, that is kept hidden from the general public, and it works as an amazing and thorough argument to stop something that (an hour before) we didn’t even know could be possible.